How to Govern a People-King? Pierre-Henri Tavoillot is a philosopher. He teaches at the Sorbonne Université (Faculté des Lettres), and at Sciences-po where he is Président du Collège de Philosophie. His work focuses mainly on authority and the art of politics in a democratic age. He is a regular lecturer for corporations and for local groups. He has been a member of the Conseil d’Analyse de la Société [Board for Social Analysis] (alongside the Prime minister, 2004-2013) and of the Comité d’éthique [Ethics Board] of the CNRS (2011 – 2015). The definition of democracy is clear: according to the famous quote by Abraham Lincoln, it is “government of the people, by the people, for the people. . .” But what remains of the power to govern in this hypermodern age? Will the people-king have devoured it? 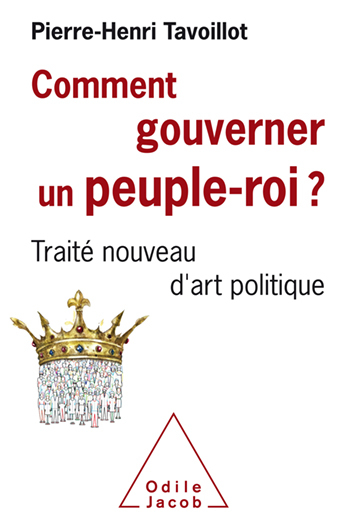 The new book by Pierre-Henri Tavoillot joins the immemorial and universal tradition of treatises on the art of politics. It is “new,” because it is aimed as much at the citizen as at those who govern, as it is true that in a democracy the art of governing is also, and perhaps above all, an art of being governed. In what conditions can we envision it today? Between the specter of public impotency and the nightmare of authoritarianism, how can we reconcile the freedom of the Demos and the effectiveness of the Cratos? This requires having clear ideas on the nature of democracy by not hesitating to ask this impertinent question: in fact, who are “the people”? And where can they be found? The book’s thesis is that the People doesn’t have a single face, but is foremost and above all a method of government, one that goes through these four indispensable moments: elections, deliberation, decision, and accountability. The book’s essential challenge is to conceive of ways to do this.